Yesterday I returned to work after my paternity leave. Going back to work after an extended time away from the office is always hard, but it is especially hard after the birth of your first born. On Monday morning I fed Sloan her bottle and kissed her (and my wife) goodbye. As I drove to campus, I had a new major motivation to work as hard as possible during the day so I could finish on time and get back home as soon as possible. Technically, my paternity leave started that Wednesday when Sidney was admitted to the hospital. However, that whole five day stretch was more of a birthing battle than a time of leave. In my heart, I consider the entire week I got to spend with Sloan out of the hospital, starting that Monday morning when we were released and ending this past Sunday evening, as my true paternity leave. It was a beautiful week. By the early afternoon that Monday, my mother-in-law and sister-in-law came back to our house with bags and bags of groceries. The contents in those grocery bags would feed not just our small family of three but Sidney’s family too, as her parents and sisters (along with their significant others and children) would join us for a week of meals to celebrate the birth of Sloan. It was a joyous time for everyone. During the day when everyone was at work, the East Coast Resers (as my siblings refer to us) still had my mother-in-law to help us out. Brenda took time off from work to put Sidney and I in the best position possible to start off as great parents. She cleaned our house, did laundry, taught us baby techniques, took care of Sloan so we could sleep, and so much more. It was very nice having her around. When she left at night, it was almost like we were internally calling out Wait…do you really have to go? But we managed to make the time special when it was just the three of us. During those evenings, Sidney and I would look on at Sloan and comment about how lucky we were. We would both jump up in the middle of the night to take care of her when she needed to be changed or fed. We would discuss who she looked like more (Sidney all the way!). We would watch episodes at 3 a.m. of a certain Netflix series we managed to complete during the week. We would doze off in a state of happiness when time allowed. And of course we would rise in a state of happiness as well. The sun shined that whole week, a weather pattern that served as a metaphor for how we felt; bright, optimistic, joyful. I would run around our neighborhood in the mornings, knowing that when I would return from my exercise I would have a beautiful wife and daughter waiting for me. We would eat breakfast sandwiches, bagels, and fruit while watching Sloan sleep in a rocker in the living room. We would lazily watch morning TV, taking turns holding the new gorgeous baby taking up residence in our house. We would smile about our new lives. I will forever remember and cherish last week. It was a time of bonding not just with my new daughter but with my wife. I will also always hold gratitude toward my mother-in-law for doing so much for us. What a lucky guy I am. Don’t Blink. Over the past 10 days since Sloan was born, the one pearl of wisdom that pretty much everyone told us leading up to her birth has proved 100% true: Our lives will change forever. Yes, it is true. Our lives are so completely different now. In fact, the comparison is pretty much night and day. Although it hasn’t even been a week and a half yet, the days when we lived a carefree existence where we just worried about ourselves seem so long ago. When family and friends told me that life would never be the same again, they pretty much left it at that. They didn’t really elaborate. I now know why. The condition and responsibility of being a parent is kind of indescribable. Sure, you can describe the physical ways that being a new parent will alter your life (changing diapers, staying up all night, going to appointments, etc.) but those tasks don’t nearly measure up to what takes over in your heart and mind. Having a baby changes your entire mindset. However, like I said, it is tough to explain. Here is just a crude example of the thinking that is so hard to describe. The last full day we were in the hospital, I slipped out for 30 minutes so I could swing by my office real fast and pick up a flash drive I would need during the week I would be on leave. I got to campus, parked my car, and walked into the building I work in. Although everything was intact and the exact same from when I left it the day I dashed off to be with Sidney at the hospital, it felt completely different. My computer, my papers, my office supplies seemed to radiate a different vibe. The air in my office didn’t feel the same. The equipment in my office and throughout the building didn’t seem as important. Although Sloan was in the hospital a couple miles away, her birth had changed my outlook on everything, even the way I felt in my office. I have noticed something else as well. These last several nights after I have been up with Sloan in the wee hours and then put her down, I couldn’t just close my eyes and go right back to sleep. Although sleep deprived and tired, my body and heart wouldn’t let me just immediately doze off like if I had gotten up in the middle of the night to adjust the air conditioning or get a bottle of water. I just couldn’t do it. Rather, I was thinking about how I am now a dad and I have a little girl in the bassinet right next to our bed who depends on me for everything and is the center of my world. This girl is always on my mind, even when she is sound asleep and I should be asleep as well. Life has so much more of a purpose now. Even though this “purpose” brings with it a lot more pressure, we wouldn’t want it any other way. This will be the greatest chapter of our lives and my wife and I couldn’t be happier to write it. Don’t Blink. Leave – I took this entire week off to be with Sidney and Sloan. It has been both relaxing and not relaxing at the same time. It is relaxing in the sense that the high pressure birth process is behind us and we get to enjoy these precious first several days of our daughter’s life. It is not relaxing in the obvious sense that we are caring for a newborn (you know, they need to be fed and changed). But it has definitely been blissful and my mother-in-law has helped us out a ton! Our family enjoying another day on leave today. 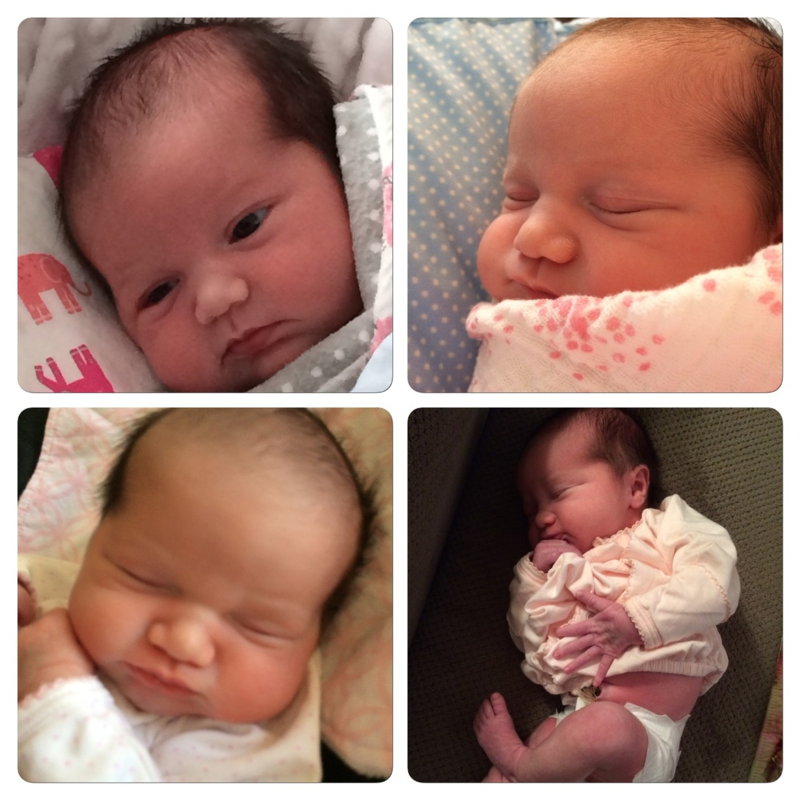 Pictures of Sloan – When my niece was first born, I routinely devoted spots in my Thursday Rundown to showcase cute photos of her. Now that I have my own daughter, you can bet that I am going to do the same for her! Here is a collage of photos I took today. Here is a collage of some of the photos I took of Sloan today. NCAA Tournament – Through the stress of Sidney’s hospital stay and Sloan’s birth, the NCAA Tournament proved therapeutic for me. I watched the first four days of the tourney from the hospital television, stimuli that helped calm me down during the tense time. Tonight the games start back up again and I will be able to watch them in our living room instead of the hospital. Of course I am rooting for Gonzaga. Best of luck to Mark Few, a class act and incredible coach, and the entire Bulldogs team as they take on West Virginia this evening. 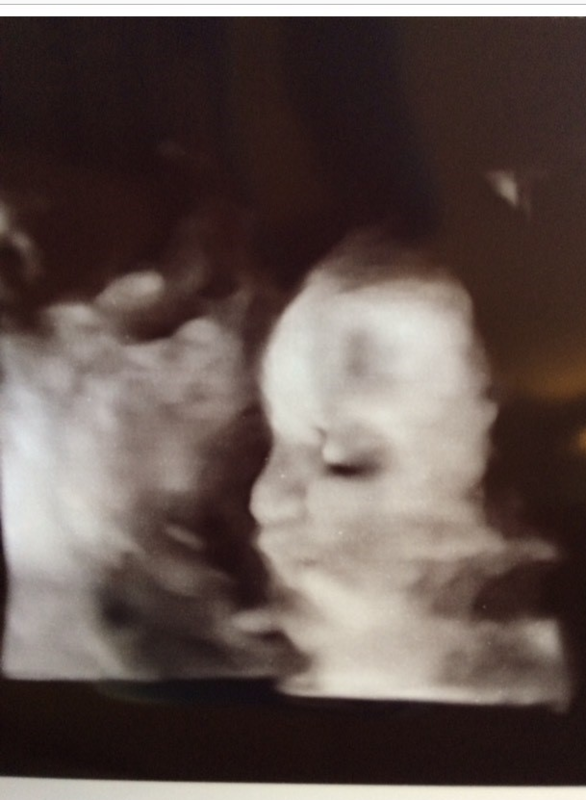 The Preview That Was Right On – Ultrasound technology is amazing. About midway through Sidney’s pregnancy, her doctor’s office installed a brand new ultrasound machine. At the time we didn’t want to share any photos for personal and superstitious reasons but now that Sloan is here, why not? This is Sloan at around 29 weeks. Pretty close, right? Ultrasound images gave us a pretty good idea of what Sloan would look like. This was taken around 29 weeks. Different Cheetos – Even though this blog post has centered around Sloan, it wouldn’t be a true Thursday Rundown if I didn’t include some random snack food in it. While walking through the grocery store yesterday, I came across something new from the Cheetos brand. Called Sweetos, you can now purchase cinnamon sugar puffs or caramel puffs. Perhaps one of these days I will try them (and maybe even blog about it). 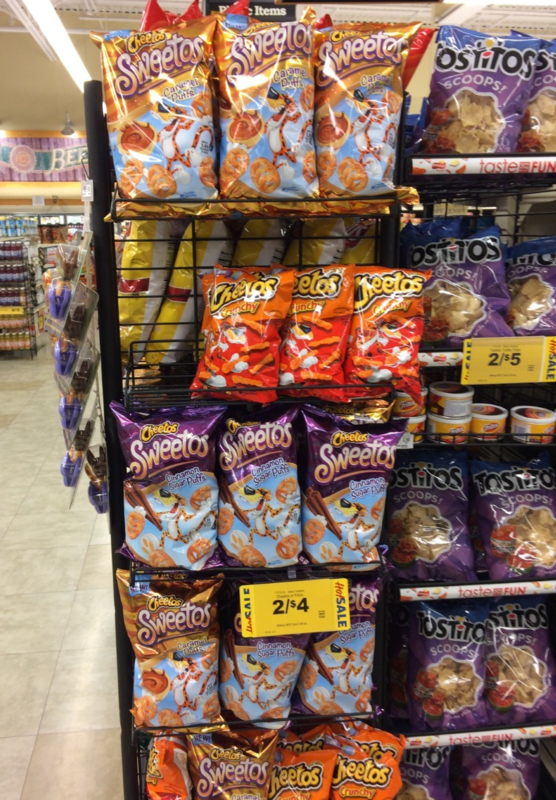 A look at some of the new sweet Cheetos (Sweetos) that are available in stores. I took this photo yesterday at our local Food Lion. Thanks for all the support and well wishes over the past several days. Hard to believe that Sloan will turn 1 week old tomorrow. Although I will inevitably start to post less to Don’t Blink as I embrace my father role, I will still continue to keep in touch. Have a great weekend. Don’t Blink. Giving birth is scary enough. Having to stay in the hospital for five whole days during this anxiety-ridden time adds a completely different level of stress and discomfort. However, if you have to go through it, all you can do is cross your fingers and hope that the people who are caring for you will make the experience as pleasant and as successful as it can possibly be. 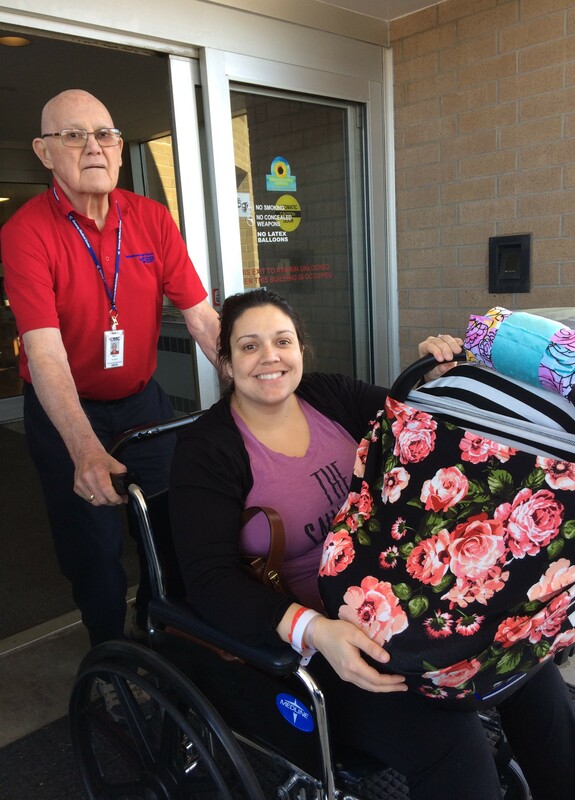 In yesterday’s blog post, I wrote about how Sidney, Sloan, and I could not wait until the discharge papers were signed and we could leave Conway Medical Center and head off to the comfort of our own home. It is true. Cabin fever had started to set in and we desperately wanted to get our daughter out of the hospital. But even through our angst, there was never one time where we (and by “we” I mean the three of us) weren’t treated with the utmost top quality care and genuine human compassion. If you don’t live in the Grand Strand area, you may want to consider moving to our beautiful area of the country for the sole purpose of having your baby delivered. Seriously. The Birthplace at Conway Medical Center blew us away throughout the entirety of our extended stay. We are very thankful to The Birthplace at Conway Medical Center for making our stay the best it could be (given the circumstances) and for delivering us this beautiful girl! 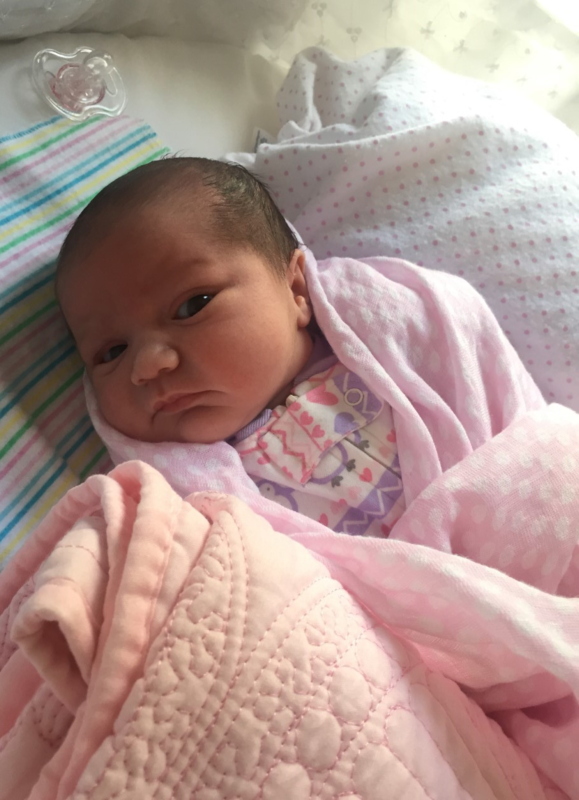 Although last Friday’s birth of our daughter was my first ever hospital delivery experience, from what others have told me, we had it very good. We were in an oversized room with a television, furniture, shower, speedy wifi, and an endless supply of items such as tissues and towels. The food service was consistent, speedy, and tasty. The doctors, whether it was Sidney’s OBGYN or the pediatrician, came by early in the mornings. I was able to stay each night and had the option of sleeping in a rollout bed or a comfortable recliner. The Birthplace itself is equipped with the latest technology. The place is totally secure. Patients and babies are kept completely protected. The nurse/doctor main station is centrally located so no matter where your room is, help is available the moment you step outside your door (although you could buzz for help at any time). The nursery is a godsend. Not only is it easily accessible and offers a great view for all visitors to see the babies, parents are able to send their newborn to it whenever they please. 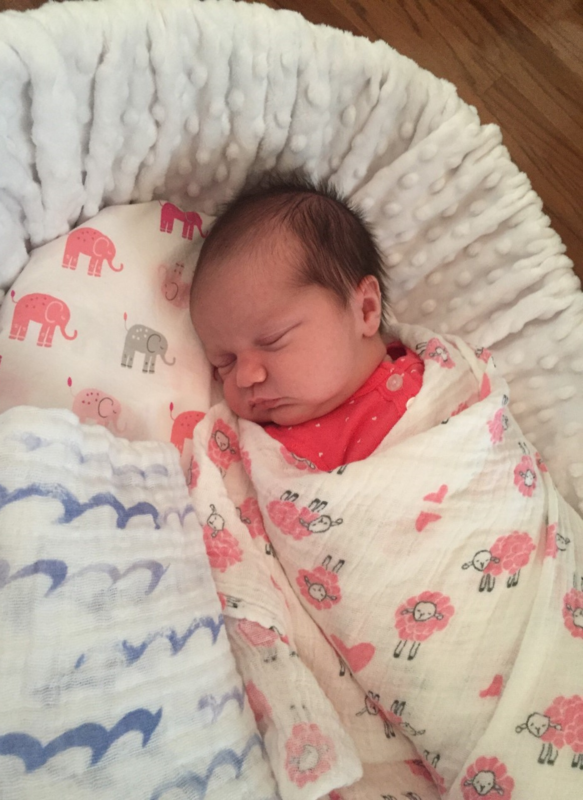 After we had Sloan, we sent her to the nursery overnight so we could get some rest after the energy draining experience we shared leading up to her birth. But the part that will forever stick out to me the most about our time at The Birthplace at Conway Medical Center, besides meeting our beautiful daughter for the first time, are the nurses we met over the six days and five nights we stayed there. The women who took care of us were truly remarkable. They took the concept of “care” to the absolute next level and watched over us in a way that far exceeded any expectations I had going in. We spent more time than we wanted to in the hospital. Luckily we were in good hands. From the time we checked in on Wednesday morning to when we were discharged on Monday around noon, the nurses took care of us. Working 12 hour shifts, we would have a nurse from 7 a.m to 7 p.m. during the day and then from 7 p.m. to 7 a.m. at night. Over the course of the shifts, these nurses provided us excellent medical attention while also relating to us as people. Sidney wasn’t just a patient, I wasn’t just the annoying husband. Rather, it seemed as if we were a high priority to them, not just another number or inconvenience. Let me tell you, if you deliver at Conway Medical Center they will wait on you hand and foot. Whatever you want to drink or whatever you want to eat, they will get it for you. If you have a question, they will answer it (or find the answer for you). If you have a special need, they will accommodate you. Best of all, the excellent service extends right to the husband. At times I felt bad asking them for something because I knew they were there to serve Sidney but they were always happy to oblige. They constantly brought me cups of ice, additional blankets, clean linens, and all the assurance in the world. After we had Sloan, the head nurse in the nursery met with me and calmed any fears that I had and explained to me that my daughter was a perfectly healthy little girl. She then proceeded to grab my phone and take photos with it of my first moments with Sloan. This is Becky, the nurse who worked in the nursery who offered both Sidney and I great support and who took some great photos in the first minutes I had with Sloan. In this photo she is giving Sloan her first bath. But it was the care they gave Sidney that will forever make me feel indebted to them. By no means did Sid have an easy go at it. Despite some of the difficulties she faced, the nursing staff was always in her corner. They supported her, sympathized with her, and even tried to be her nurse the next day if possible. Actual relationships developed to the point where the nurses who were no longer assigned to her would make the effort to come back to Sid’s room and check in on her. It became personal to them and we were so grateful for their kindness and authenticity. How good was this group of nurses? So good that my mother-in-law, a registered nurse herself and someone who tells it straight, raved about the job they did. People will mumble that the care given at the hospital should always be excellent because we pay hefty prices for it. I understand where they are coming from but I mean it when I say the care given at Conway Medical Center, especially from the nursing staff, goes above and beyond that standard of excellence. To Sidney’s doctor (Dr. Collins) to our pediatrician (Dr. Sangtian) to the nurse who taught our birthing class (Tammy) to the fabulous crew of nurses who helped us out during our stay (Penny, Becky, Dixie, Tracy, Jeana, Jill, Jennifer, Tracy, Abby, Amelia, Faith)…THANK YOU. We sincerely appreciate the incredible job you did. Don’t Blink. 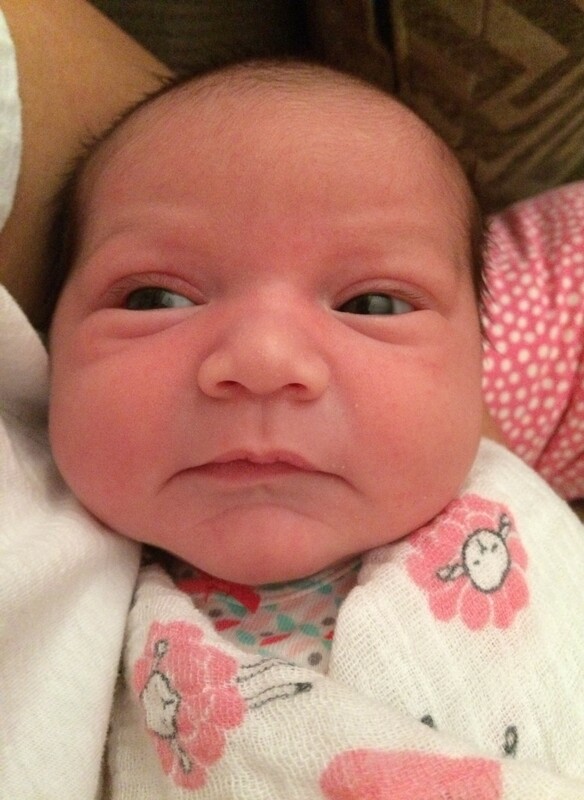 As I sit here in our living room admiring our beautiful baby daughter, it is hard to come to grips with one thing. Last week at this time, Sidney and I had gone to work and lived our lives just like any normal day. Seven days later we now live an entire different existence, one that transformed through dramatic events over the past several days. The hard part isn’t that we have our precious Sloan (hardly); rather, it is just conceptualizing the fact that the crazy delivery journey we went on started less than a week ago. Currently I am admiring my baby daughter. Let me introduce all of my readers to Sloan. Last Wednesday seems like forever to me. After I finished my workout I called Sidney to check up on her as she wasn’t feeling too well that morning. Expecting her to tell me that she stayed home from school or that she had started to feel better, she told me something completely different. The doctor’s office had advised her to go to the labor and delivery wing of Conway Medical Center to get checked out. I jumped in the locker room shower, got dressed, dashed into my office for two minutes, and rushed to the hospital. Throughout the entire week-long saga, including throughout the C-section, I didn’t come nearly as close to passing out than at that moment. I had to ask my sister-in-law to let me sit down in her chair to gather myself for a second. Sidney, the person who should have received all the support and attention at that time, coached me to put my head between my legs and take deep breaths. The journey had just started. The journey had just started but it would ultimately end with this beautiful girl. 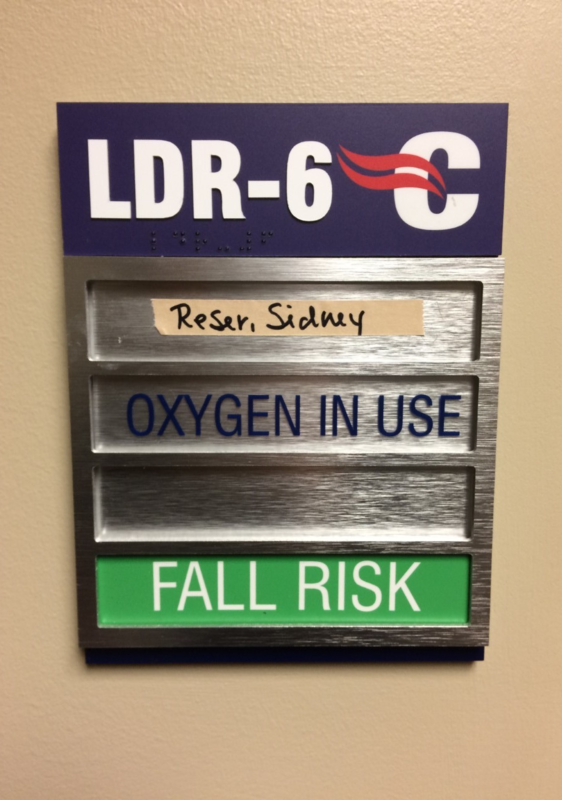 Sidney would be transferred shortly thereafter to an actual labor and delivery room (we were in an exam room at the time). Once in the new digs, the failed induction process would span over three days. 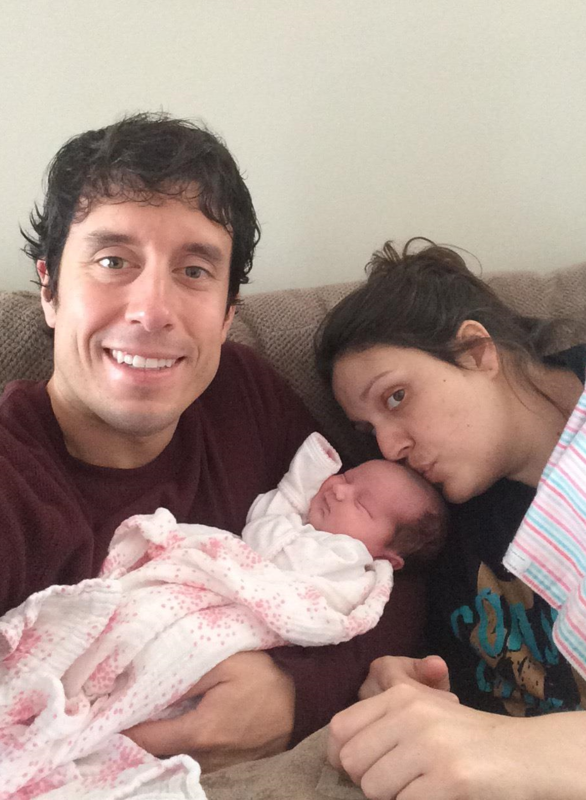 At around lunchtime on Friday, with the medications given to her ultimately counteracting each other resulting in only mild contractions, the decision was made to go with an unplanned C-section. 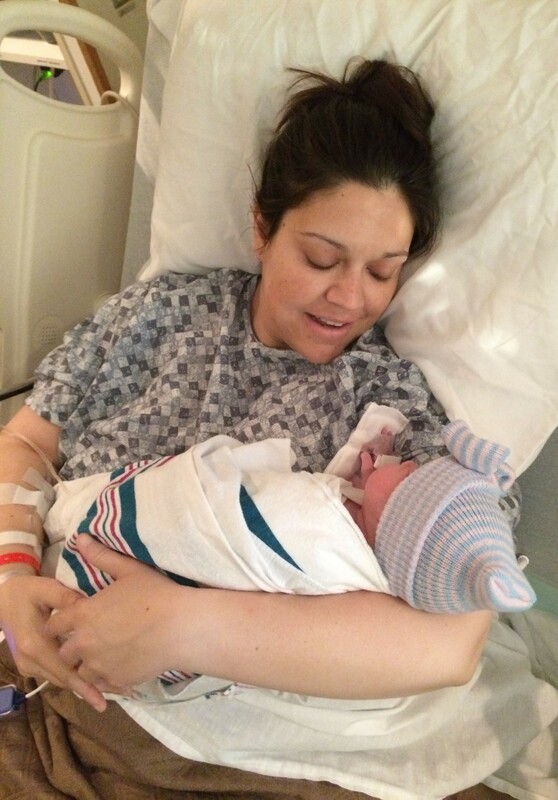 By 3 p.m. on that glorious St. Patrick’s Day, we welcomed Sloan Anne Reser into the world. 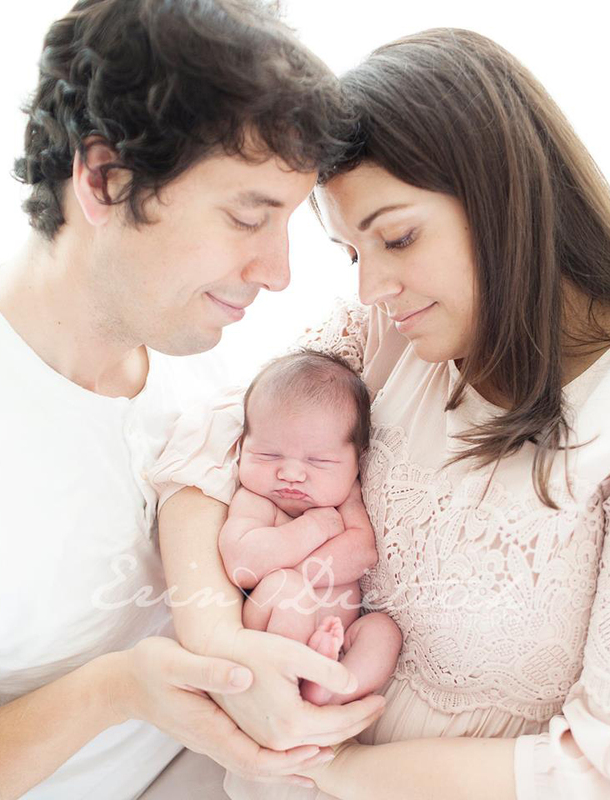 We are so pleased with our daughter Sloan. 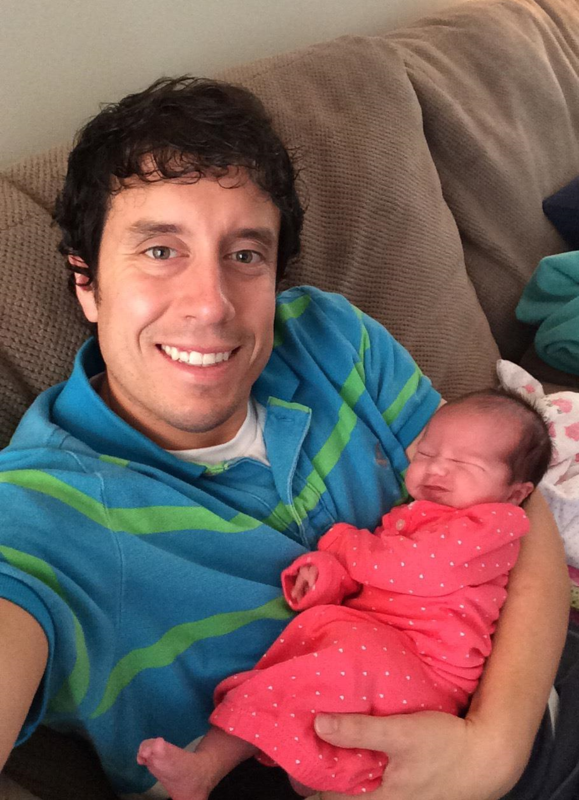 After Sloan’s birth, three more nights in the hospital followed. Although Sloan was doing great, the medical staff needed to monitor and treat Sidney. As we spent Sunday evening in our postpartum room, the final night of our stint at Conway Medical Center, it would be an understatement to say we were itching to get out of the place. Although we couldn’t be more thankful to the nurses and doctors, it was time to check out. When Monday morning rolled around, we were so ready to go home! 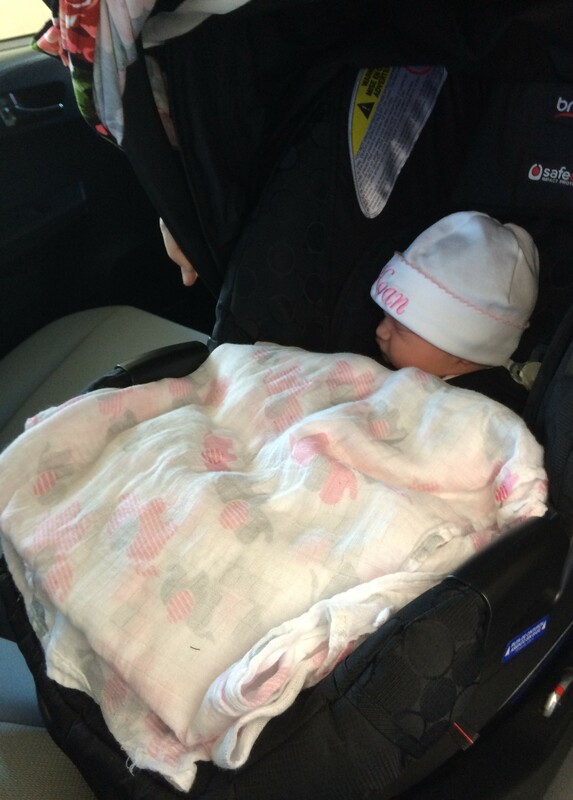 Sloan on her way home from the hospital. This post was meant to just give the bare bones of our crazy and unpredictable ride. In the future I hope to write more about specific parts of our experience. But let me tell you this: Sidney was so brave throughout the entire 5+ days spent at the hospital. True to her sweet nature, she has said numerous times since we have been home that the unique ordeal was totally worth it. Sloan is now home and we are so happy. We are incredibly happy. Sloan has already stolen our hearts and is the sweetest baby we could have ever imagined. Sidney is still healing but she is one proud mama. We thank everyone for your constant support and we can’t say enough how great God is. Don’t Blink. “Well, won’t you have a lot to learn too?” I asked back. “No, not really. But I will have a lot to teach you,” she countered. Then, not too long after that, she spoke again. No joke, that is how the conversation went verbatim. But don’t think that Sidney was giving herself too much credit. It is true, she is a baby pro. She has taken care of babies and kids since she was a teenager. Parents swear by her. She has been called a “baby whisperer.” She worked in a popular Myrtle Beach baby store. She has dreamed about having a baby to call her own since she was little. So, when our daughter is born, it surely won’t be the blind leading the blind. It will be someone who knows her stuff teaching someone who has never even changed a diaper before. The first step to preparing yourself to learn is by admitting your ignorance. CAN YOU HEAR ME!? That is me jumping up and down saying that I know very little about baby care. Well, perhaps I can cut myself some slack. I have definitely done my due diligence the past eight months reading books, asking questions, and picking the brains of other dads. So perhaps I do have some knowledge when it comes to babies but I have very little practical experience. The learning curve will be steep. But that is why I am so lucky to have Sidney, a woman who not only is excited to teach me but who is a teacher by profession. Motivation and skill on Sidney’s part will go a long way to helping mold me into a good dad. Perhaps that is why I am not scared (yet) for the baby to come, just a little nervous. There is no reason to be afraid when I know I will be taught the tricks of the trade by the best person possible. The nerves come from the fact that I know I will still screw up plenty of times and probably look stupid in front of my in-laws. But I can handle that! Pretty soon I will be receiving on the job training from a seasoned professional. Hopefully Sidney will still be excited to teach me a few months in. Don’t Blink. For tonight’s blog post, Sidney and I just want to say THANK YOU. 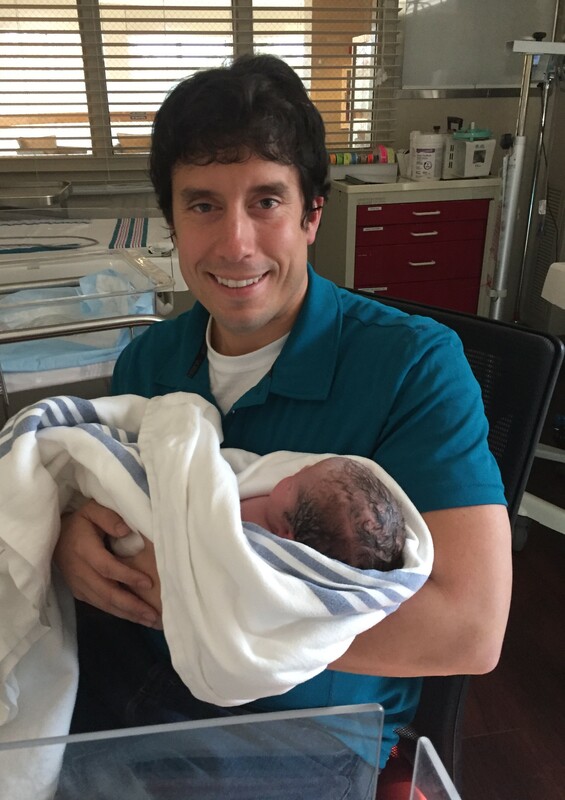 Leading up to the birth of our daughter, we have received so much from our family, friends, and co-workers. It has reached such a humbling point! 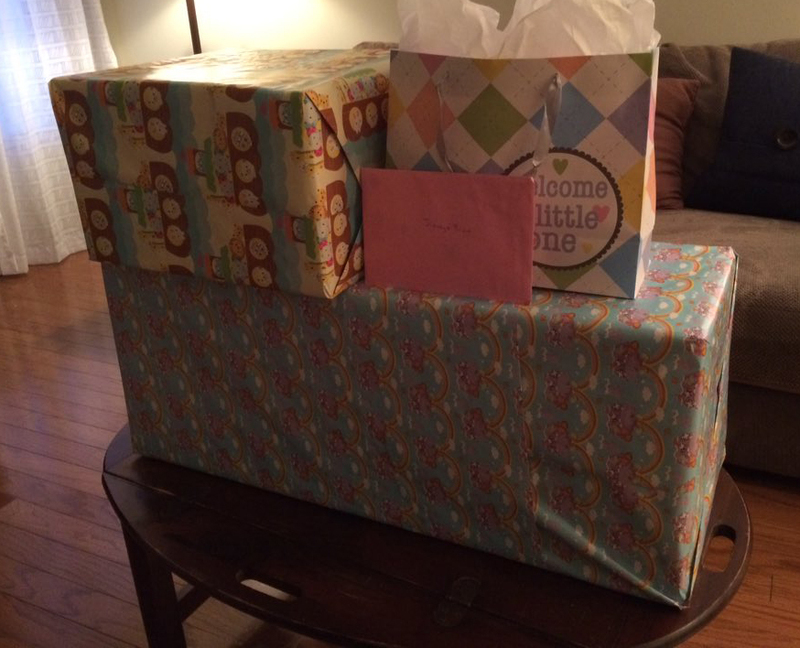 In December, my aunts threw us a mini baby shower when we were in Spokane. At the end of February, Sidney’s sisters organized her official shower. 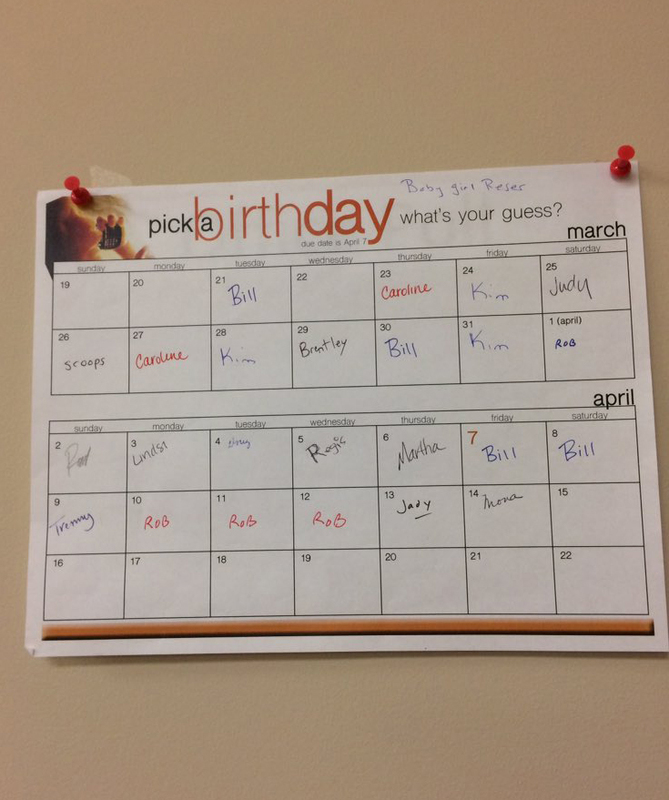 Today, our places of employment celebrated the upcoming birth. 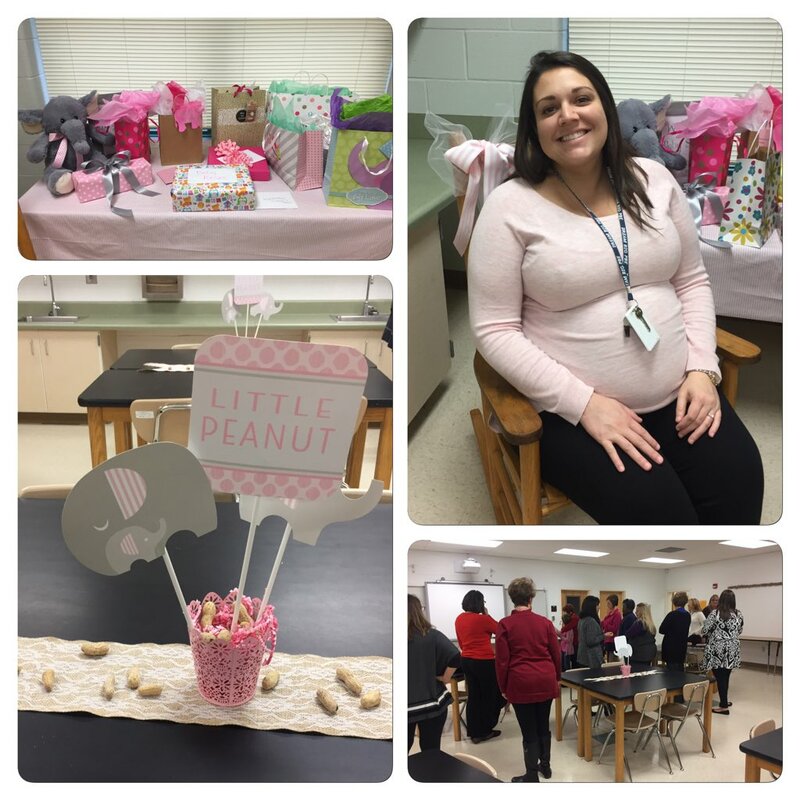 This afternoon, once class ended for the day, the teachers and administrators of Palmetto Bays School treated Sidney to a special baby shower complete with food and decorations. With all the attention on her, Sid sat in a rocking chair and opened up gifts. Sidney works with a great group of teachers! They made her feel so special today. A few hours before Sid’s shower at school, I was loading up my car with gifts given to me by our communication office at Coastal. My co-workers and bosses have done so much for me since the moment I stepped foot on campus almost three years ago and this was just another example of them going above and beyond. My Coastal family has treated me so well since I started working there. I took these gifts home today. However, each material gift we have received from someone has seemed to come with something better. Whether it be a heartfelt card, a text asking how an appointment went, an office poll on when our baby will be born, or the constant reminder that we are in prayers, we have been the benefactors of so much love from so many different people. We are so grateful. My office predicted when our baby will be born. Should be interesting to see who wins! We will get around to personally thanking each and every one of you in the near future. Until then, please know that we are extremely appreciative. We feel very spoiled but we also feel very loved. THANK YOU. Don’t Blink. Good evening, everyone. I hope it was a tremendous weekend for all. I want to start this short blog post by recognizing CBS. The selection show this year was exactly what it needed to be. This year’s edition was of course a major improvement over last season’s disaster but it also was a superior show compared to the last several as well. The bracket reveal this afternoon was quick and predictable. Greg Gumbel started with one region and read through it all before going to a commercial break. When the show returned he read completely through the next region before the next commercial break (and it went on like this two more times). Gone was the nonsense of revealing the #1 seeds one at a time. Gone was the travesty of NBA late night guys making picks on partially revealed brackets. Gone were the excessive commercial breaks. Gone was the ridiculous shenanigan of trying to slow play the bracket so you had to wait two hours until it was completely revealed. CBS learned from last year and provided us viewers with a much better product in 2017. With that said, something did not change from last year. Sadly, I once again only have one team I truly care about participating in the Big Dance. The basketball teams from the university I currently work at and the university I used to work at fell short in their conference tournaments. Because of this, I will be cheering hard for Gonzaga to make a very deep run as a #1 seed in this year’s NCAA Tournament. My Spokane hometown allegiance and my stint as a ball boy for the Zags gives me all the incentive needed to support them this March. I really hope Mark Few leads Gonzaga to a Final Four. Enjoy the madness, everyone. Put down those stupid specialty brackets and concentrate on the 68 teams that got a ticket punched for the greatest tournament in sports. Best of luck to all the student-athletes participating. Don’t Blink. 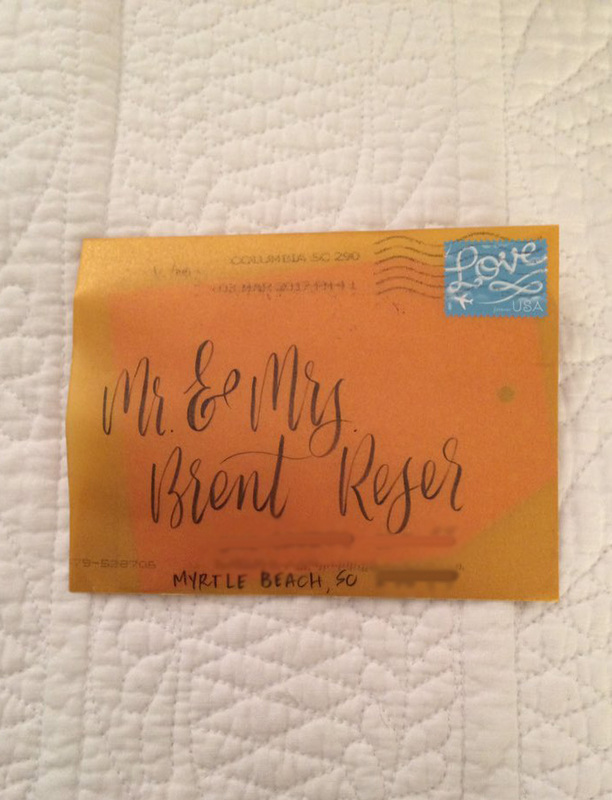 Snail Mail – Our favorite calligrapher now sends us beautiful cards in the mail. Brooke Holden, the person behind our chalkboard baby announcement, is now sending customers/newsletter subscribers a few personalized cards in the mail each year. They come randomly and are such a nice surprise. Check out Brooke’s website if you have any calligraphy needs. Inside this perfectly addressed envelope were samples of her work using the names of Sidney and I.
Coastal Now – At Coastal Carolina University, we produce an awesome show called Coastal Now. Some of you might know that I have my own social media segment on the show called the Social Circle. Well, the latest episode has been released. 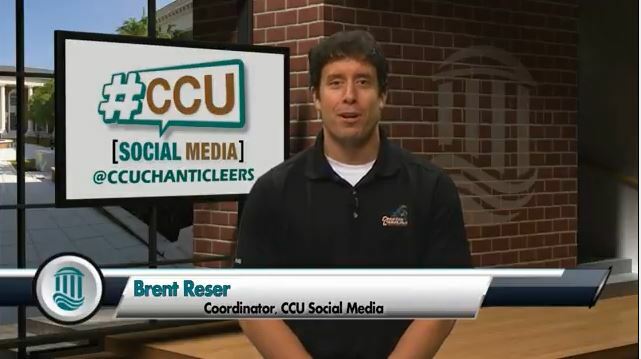 In this most recent segment, I highlight our #CCU Keys to Success campaign. If you have the guts to watch me on camera, you can watch it by clicking here. If you the time, take a look at my latest Social Circle segment. Baby Update – After all the excitement we had this past weekend preparing our house for our new addition, things didn’t slow down completely this week. We had another ultrasound today where we had another beautiful opportunity to see our daughter. 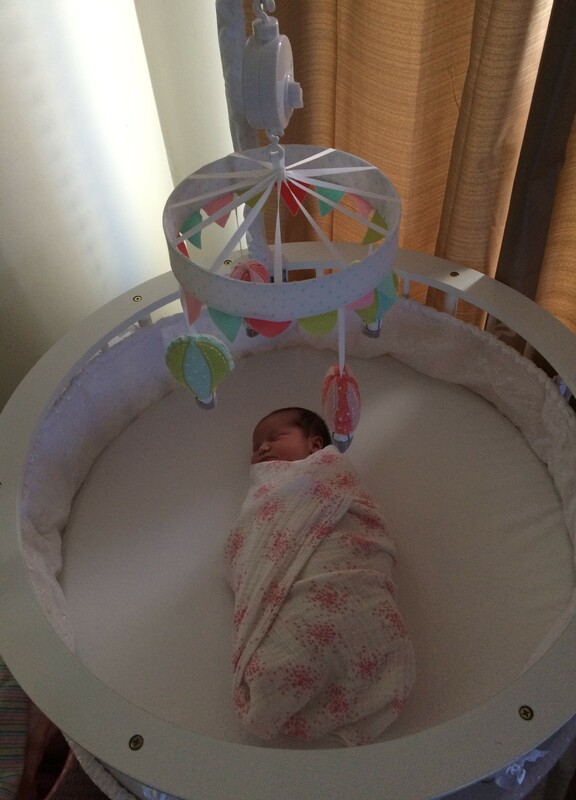 Last night, my father-in-law set up the bassinet where our baby will sleep for the first couple months. Pretty glamorous, right? Last but not least, Sidney has her work baby shower to look forward to on Monday. 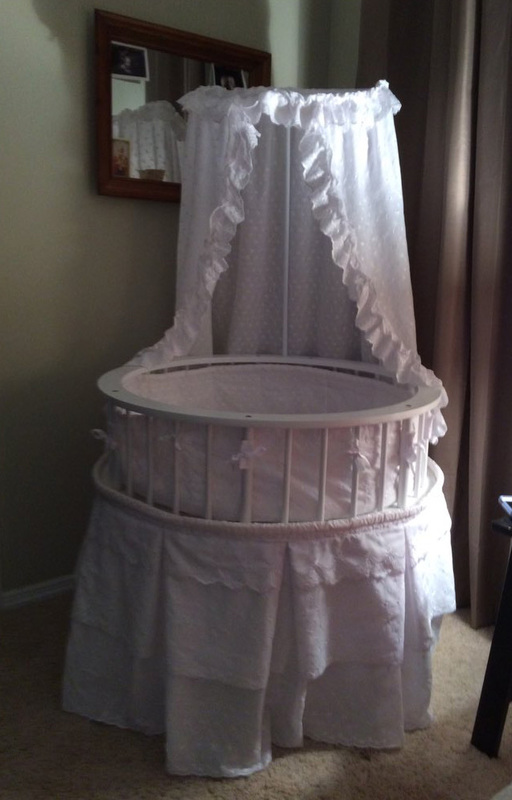 This bassinet is now in our room waiting for our daughter. Top Movie When I Was Born – Last night I made a big deal about the website that allows you to find out what the #1 song in the country was at time of your birth. Believe it or not, that same website will also tell you the #1 MOVIE in the country at the time of your birth as well. What film was generating the most money in the theaters when I was born? It was “Crocodile Dundee.” I don’t know if that is something I should be proud of. This Is Us Reaction – Like much of the country, Sid and I have devoted Tuesday nights to watching “This Is Us.” The second to last episode of the season was this week and it left us with a cliffhanger along with possible clues on how the dad (“Jack” played by Milo Ventimigila) dies. All I can say is this: I sure hope NBC is just giving us a little bit of misdirection and that Jack doesn’t die drunk behind the wheel. In my opinion, I think that development would be even worse than the angle of Kevin getting back together with his ex-wife. That is all I have for now. Enjoy your upcoming weekend and thank you for your support of my blog. Don’t Blink. As Americans, we like to put historical events in context by using music. If a record is broken or a major change occurs, the media likes to put the length of time in perspective. Many times, this will happen by reporting that (insert random song here) was the #1 song in the country when Barack Obama entered the White House or (insert another random song here) was the #1 song in the country the last time the Connecticut women’s basketball team lost a game. Staffers for these news outlets used to actually have to research music charts to get the correct data. Now there is a website that does it instantly! For a good time, I would suggest visiting http://playback.fm/birthday-song or just click here. If you want to see what was the #1 song in the country on the day you were born just type in your birth date. Within seconds you will have the song accompanied with its music video. For tonight’s blog post, I want to bring to light the songs that reigned supreme in the United States during some of the defining moments of my life. To make sure I don’t get off too easy, I will also add a sentence or two of personal observation (much like I did when I wrote about the defining songs of my years a couple years ago). Okay, get the jukebox fired up! Observation: Watched this music video at home via our Apple TV and laughed out loud while shaking my head at the crazy decade I was born in. Milestone: I become a big brother! Observation: Today we have fake news, back when Glen was born we had fake artists. Observation: Despite the best efforts of T-Boz, Left Eye, and Chilli they never convinced me I was anything else besides an awkward looking goofball. Observation: Believe me, there was never the desire nor the chance to “Get Busy” in my 1989 Nissan Sentra. Observation: Now why wasn’t this the theme of our 10 year high school reunion? Observation: Boom Boom I AM A COLLEGE GRADUATE!! Observation: Although super excited for my new adventure, I wasn’t exactly “happy” when I had to say goodbye to my mom in the hotel parking lot that morning. Observation: Same song as above, although this time a true happy feeling. Observation: We shared several dances at the reception, but our first one was to “How Long Will I Love You” by Ellie Goulding. The next big milestone will be the birth of our daughter. If she was born today, that means the song would be “Shape of You” by Ed Sheeran, something that Sidney and I could definitely live with. Will the song stay #1? I like our chances. Don’t Blink.